Lee and Stuart from Warcradle Studios have some exciting news! Check out our latest video to hear all about our new setting: The Dystopian Age. We are excited to announce the launch of the Dystopian Age - a rich and expansive setting for a range of science fiction games from Warcradle Studios. The Dystopian Age takes place in an alternate 1870s. It is a world where the heroism, greed and ambition of humanity is matched only by a scientific genius that has changed the world forever. What does being part of the Dystopian Age mean for Dystopian Wars? Having a larger canvas means that we can take concepts and designs from Dystopian Wars and explore them further. We have made the factions as outlined in Dystopian Wars as the starting point for our work in this new setting, so that means there will be a great deal of material that is immediately very familiar to Dystopian Wars players but at the same time there will be some new twists that we hope will surprise and delight. What does being part of the Dystopian Age mean for Wild West Exodus? Let's look at some of the games we will be developing in the Dystopian Age. Dystopian Wars is 1:1200 scale game of naval battles pitching eight factions against each other in a struggle for supremacy on the open seas. All factions make use of a mixture of aerial support as well as powerful warships, cruisers and frigates to sink or drive off the enemy fleet. Armoured Clash is a 10mm or 1:160 scale game. It is a game of land battles as the mighty empires of the world clash in the varied landscapes of Africa as they attempt to establish colonies, conquer enemy territory and claim the riches of the land for themselves. Though Africa forms the main focal point of the narrative battles, Armoured Clash will feature flashpoints all over the globe as the great powers grind against each other. The eight factions from Dystopian Wars are also present in Armoured Clash. Armoured Clash will feature new rules and a new scale for land battles, but a popular one with a range of scenery already available. Players with existing miniatures can still use them, though a whole host of exciting new miniatures are being developed. To accompany the Beta test, we will provide a detailed ‘counts as’ guide so that players know exactly how to use all the models in their collections in this fantastic new game. Wild West Exodus is a 35 mm (1:48) scale game of brutal skirmishes in the American Frontier. 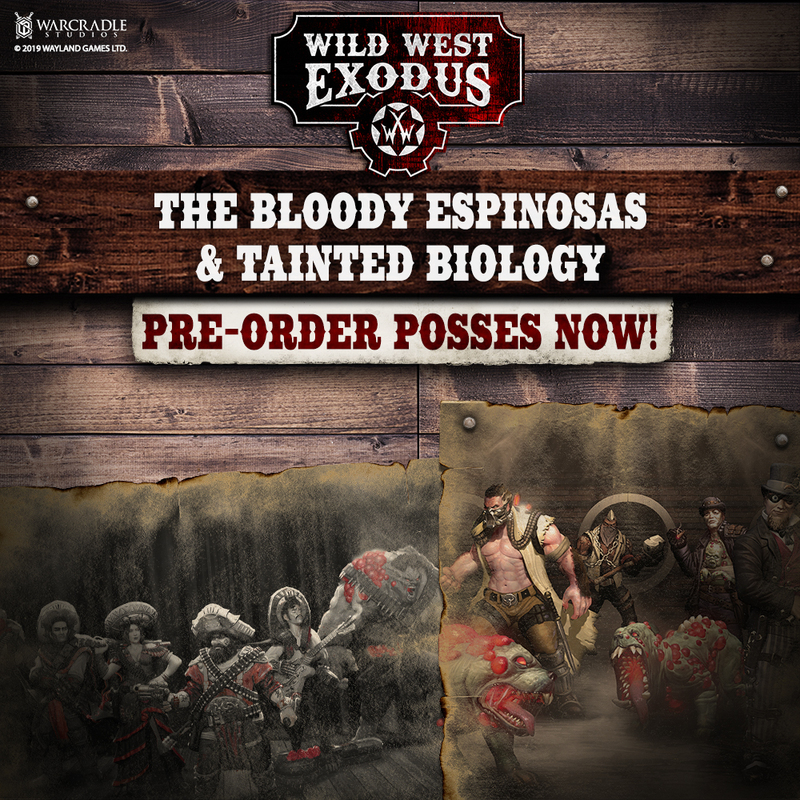 There are eight factions for Wild West Exodus, and all these factions are currently available. We have a host of exciting releases planned for the game throughout 2018 and beyond. Being part of a larger world mean that some of the future plans we had for WWX are now going to be reworked. From a factions point of view, it will mean that the Crown and Celestials will now move out of WWX and the game will remain with the current eight clearly defined factions. Of course there will be Posses and units that can ally with those factions, but the factions themselves will find a new home ‘elsewhere’ in the setting, but we’ll talk about that another time!